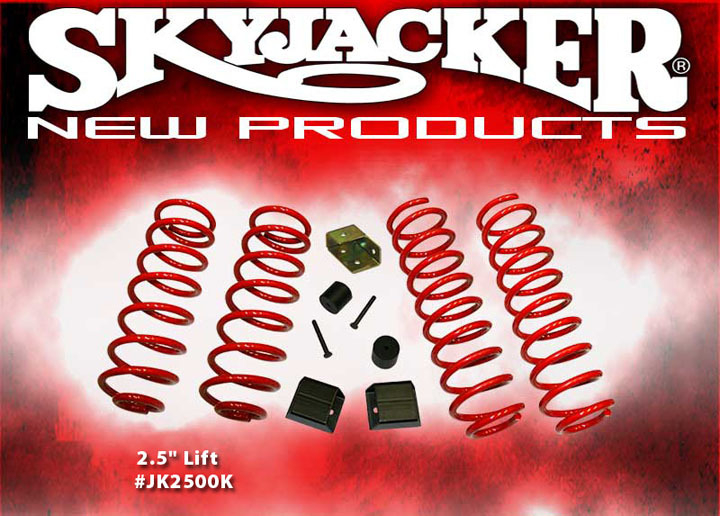 Well, I just got news that Skyjacker is officially gonna be number two out of the gates featuring a well developed 2.5″ suspension lift kit for the 4-Door 2007 Jeep JK Wrangler. And, from what I’ve been told, this lift will get your Jeep JK sitting comfortably on a set of 33″ tires. Included with this kit will be front and rear coils (specially designed for the 4-Door JK) painted Skyjacker red, bump stop extensions and a rear track bar relocation bracket and all for a low retail price expected to be about $300. Although shocks are not included with this kit, you can buy a set of their Hydro Shocks for an additional $160 or a set of their Nitro Shocks for about $180. Overall, I’d have to say the Skyjacker 2.5″ JK 4-Door Suspension Lift is a really great starter kit and the only real drawbacks it has for me personally is the fact that it doesn’t come with a front track bar relocation bracket, rear sway bar links or a set of front sway bar disconnects. And, so far as I know, none is offered separately for purchase (yet) either. Anyway, I’m glad to see more JK suspension coming our way and I’m eager to see who’s gonna be next! Correct me if i’m wrong, but the JK is supposed to have an electronic sway-bar disconnect system. Not sure how this will be addressed, or bypassed and replaced, but it is a detailed to be considered with these first generation JK lifts. I do stand correct. Thanks for the update and Kudos to SJS for the additional info. $300 seems like steal.